What kind of story can I make up about these three rocks? 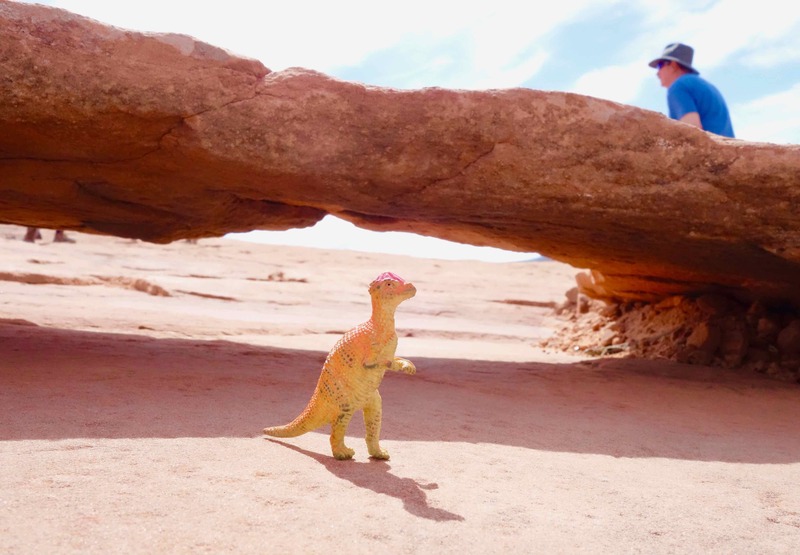 I did make up a story in my own mind about these rocks: An old wizened scientist with a long neck and tiny head went walking with her dog behind her and discovered a three-toed dinosaur fossil lying on the ground in front of her. 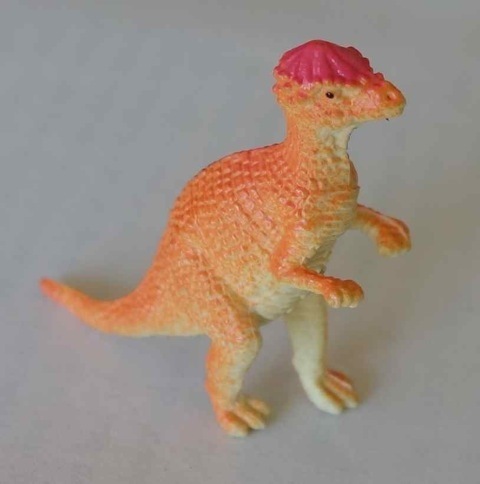 She yelled, “Eureka, I’ve found it!” Then, her very smart dog asked in a barking voice, “Now where’s the rest of that dinosaur?” They never could find it. End of my made-up story. Another time, we hiked and, for just a moment, the trail looked like it was moving. “Wait, Papa, what’s that?” I asked. We stopped, looked, and took this photo. 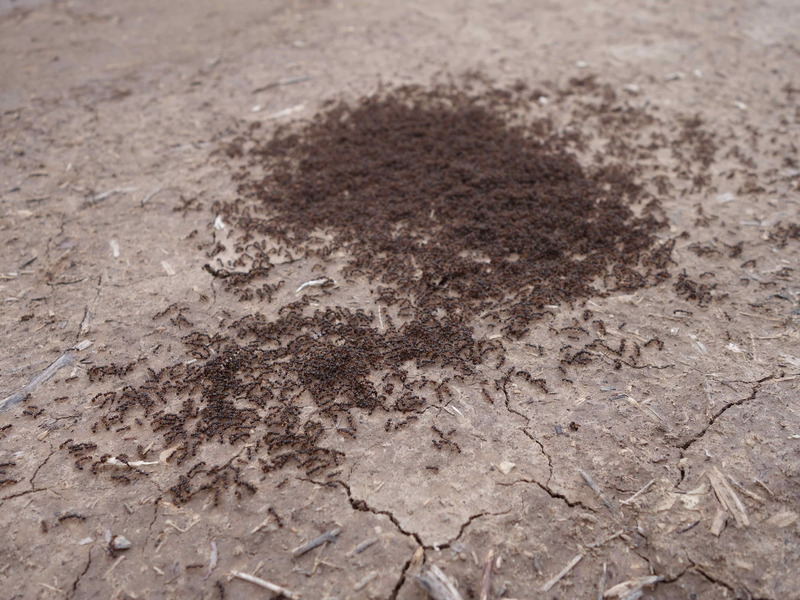 Sometimes when we hike, we see a few ants, and other times we see a lot of ants! Nona reminds me this mob of ants was on a trail in Moab, Utah. Maybe my third example of strange sightings is the best, because I think it is the yuckiest. Sometimes yucky can be good. If you know what these are, please tell me. 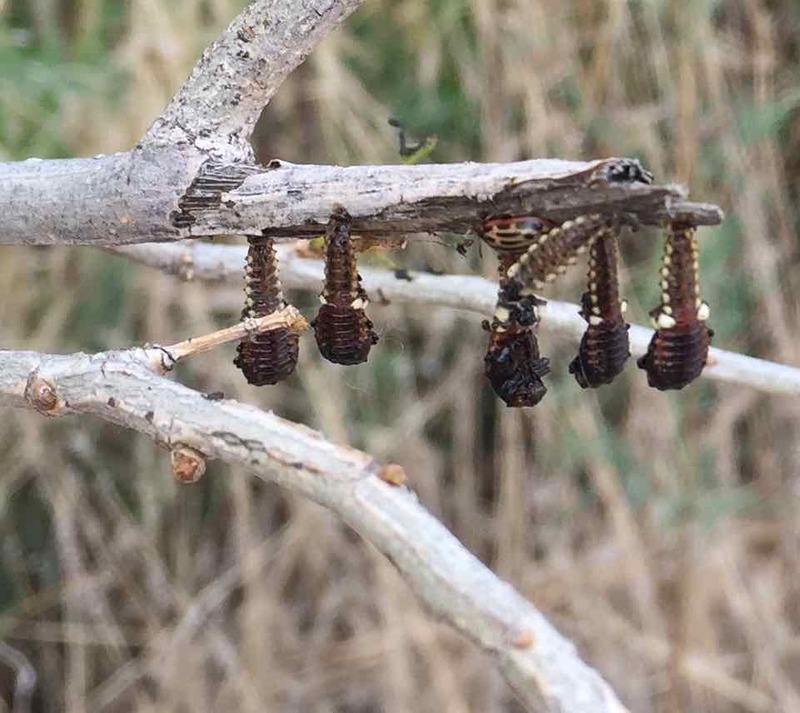 We think they are some sort of larvae, hanging upside down. Now, my last example, will take you from really yucky to really pretty. A rain storm was off in the distance on this hike. The sun shown just right, and we stood in just the right spot to see these. OK, I know what this is: 2 rainbows. A double rainbow! You know, it is said that a pot of gold awaits you at the end of a rainbow. 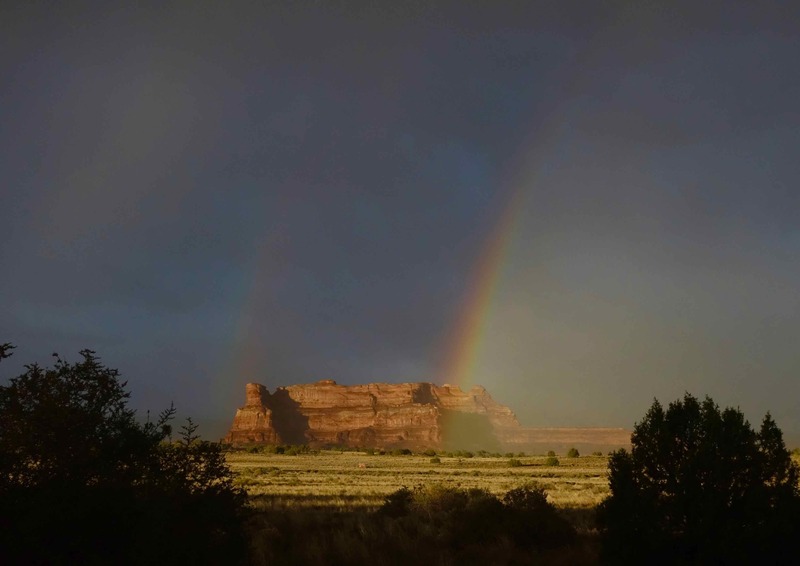 Do you think that maybe we could be seeing the location of 2 pots of gold here? Well, we didn’t go look for them, because Papa claimed that no matter how fast and how far you travel, you can never reach the end of a rainbow. “Solbit, that’s a lovely saying, but it’s a fool’s errand,” Papa told me. I’m sure what Papa said must be true, but, still, I kind of wish we had gone to look for those pots of gold. I wonder if you have ever tried to get to the end of a rainbow? Let me know if you did and if you found anything there. 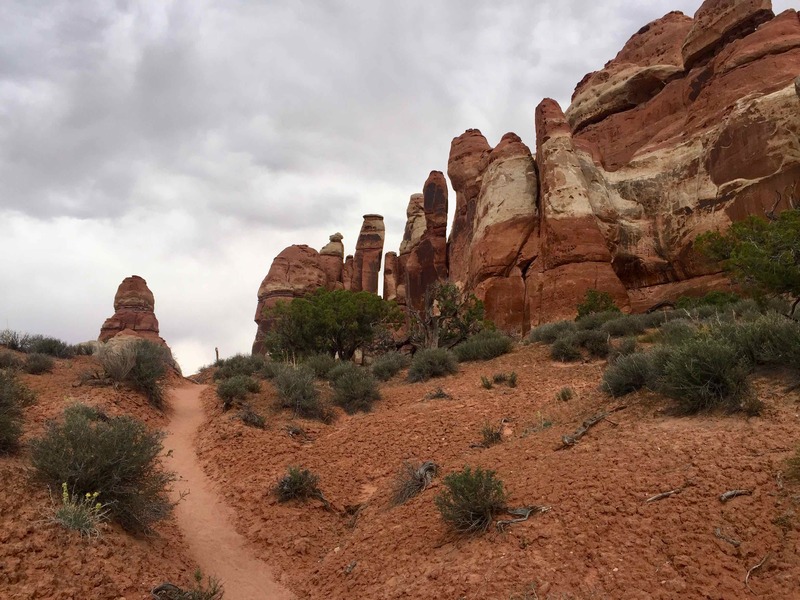 We just had to go back for one more visit to Arches National Park. I didn’t get to see enough of those grand arches. If I counted right, I have seen about 50 arches. 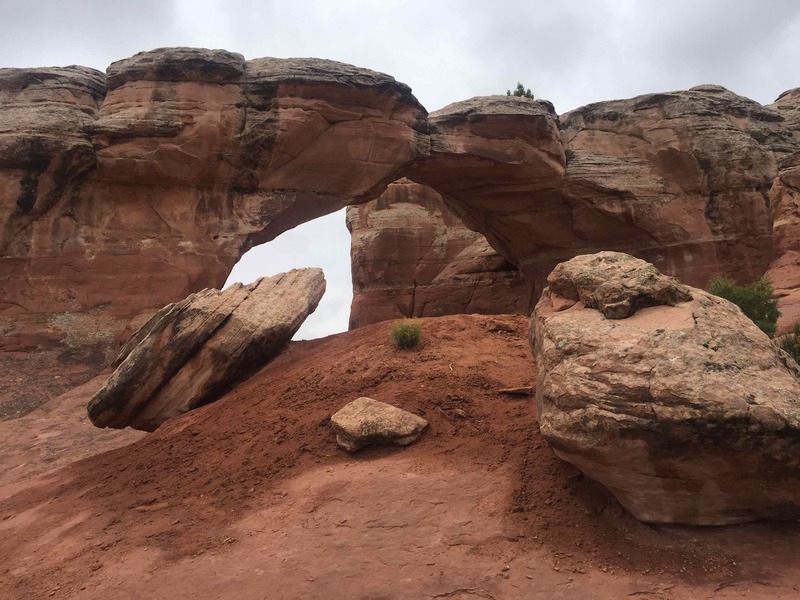 When I look at this arch from this spot, I wonder: did that rock in front of me come from where that arch is now? This place just invites me to ask one question after another. For example, I wonder how long it would take me to see all the arches here? I can look in almost any direction to see another arch. This one is far away. If I look near or far, another arch or several arches come into view. 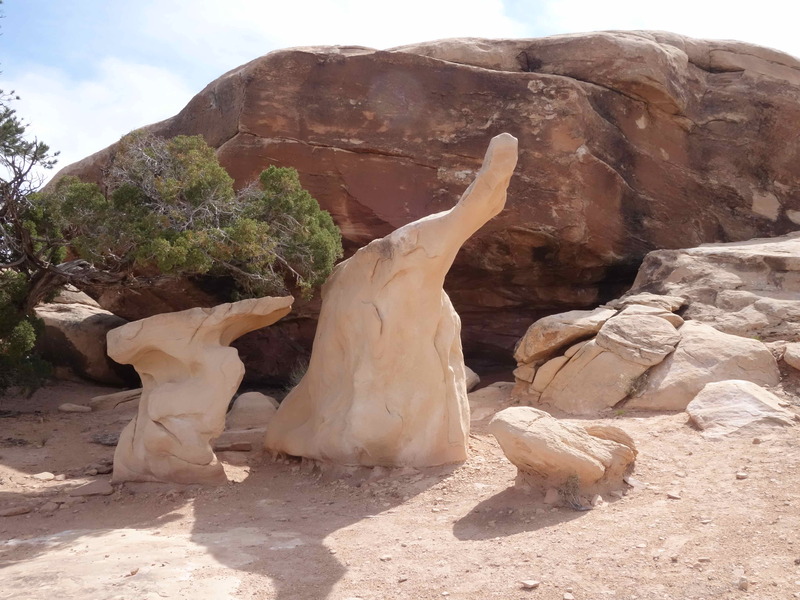 I wonder how many arches has nature made here? What’s beyond this arch is hidden, and that makes me want to go through it to find out what’s there. Call me an explorer. When you start walking in this national park, you just become an explorer. You can’t help it. These huge rock features and their natural beauty pull you in. I like that. Every arch is different yet somehow the same. I think I see a face at that top of this one. Do you? At first, I thought maybe someone had chiseled the face of a bulgy eyed fish up there, but then I thought it was a dog. Of course, it’s just my eyes playing tricks on my mind. How does nature do this? Two arches and two pillars perfectly placed? I wonder whether these two aches (above) will still exist if I return to find them in 50 years? 100 years? a 1000 years? How long do they last before gravity pulls them down? These two arches appeal to me because of the blue spaces they make. Nona and Papa made me move on, but I just wanted to stare at those blue spaces under those arches and let my mind wonder. Sometimes I saw a human face under that back arch and sometimes I saw a stingray (one of those ocean creatures) in that top space. Now Nona and Papa are taking me out to supper, so I have to go. 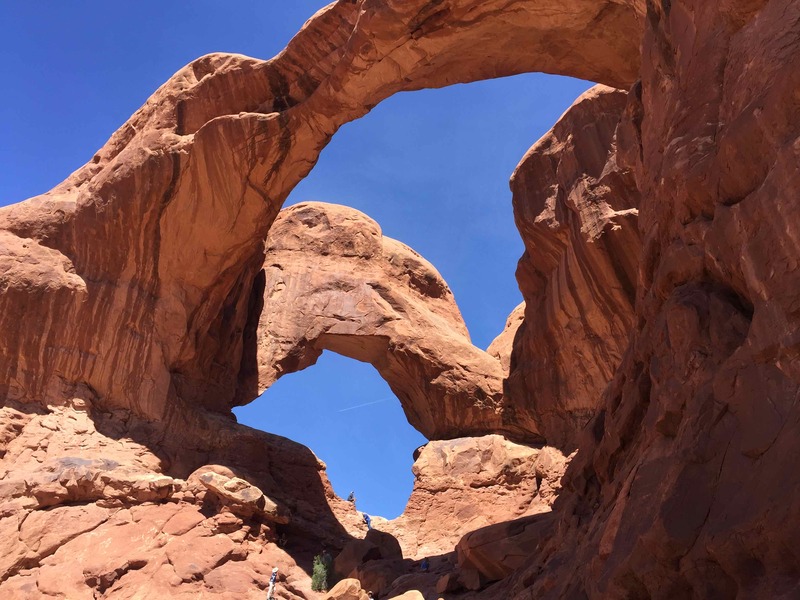 The nice thing about these pictures of arches is that I can come back to them almost anytime I want — except when Nona and Papa say we have to go. Like right now! Bye! I’m your friend. Hey, guess where we are? We’re up the creek. Don’t worry though. 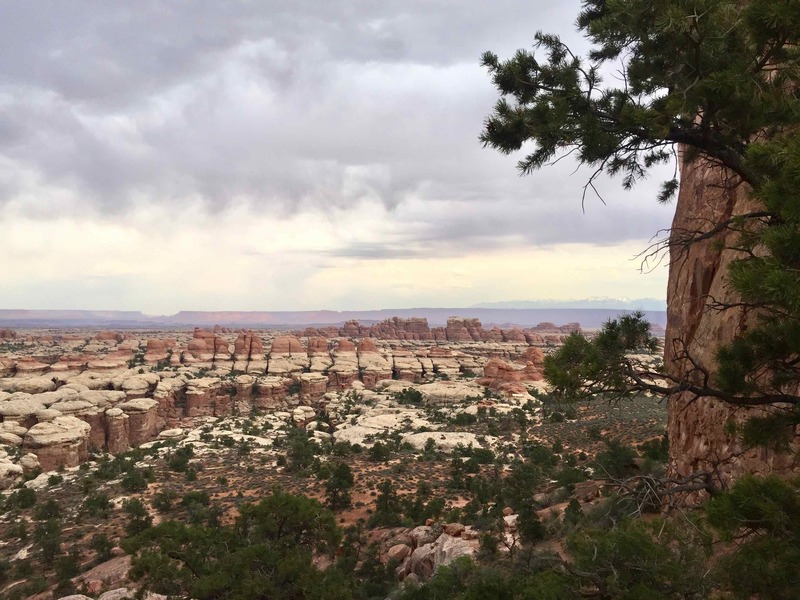 We’re quite happy being up the creek, because we’re camping in the heart of Moab, Utah at Up the Creek Campground. If I weren’t taking this photo (with Nona’s help, of course), you would also see me looking in the same direction as all these folks. 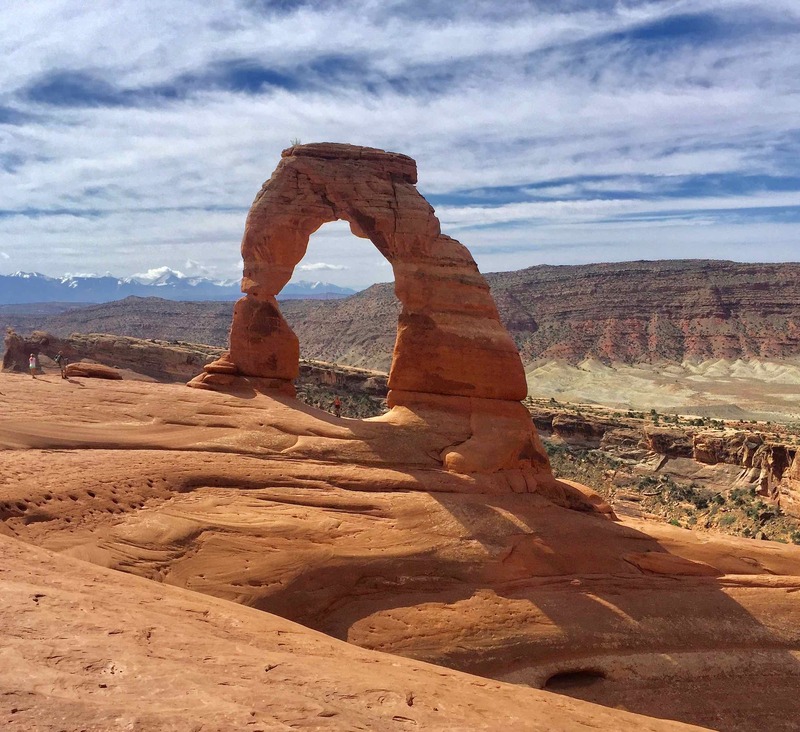 Here’s how this national park got its name, Arches. 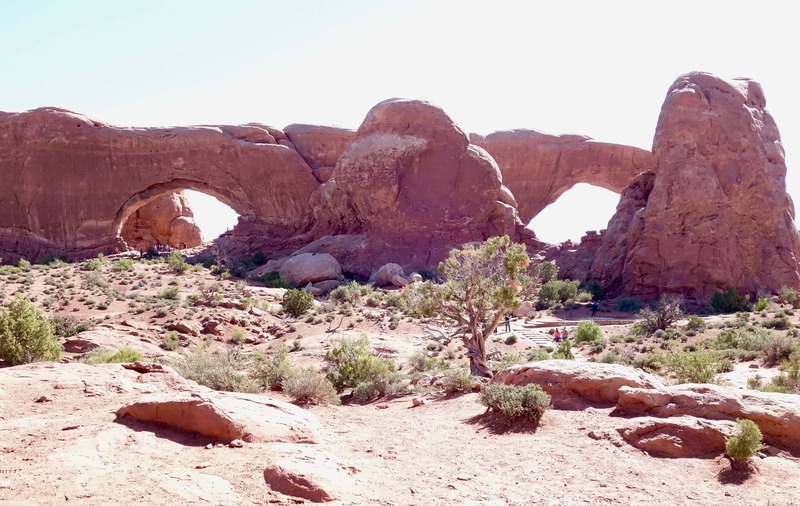 Arches of rock are everywhere we look. Girl, these are BIG arches, not like the arches of your feet. I’ve always wanted to be like everyone else. Maybe that’s because I’m so much smaller than all the people around me. Maybe because I look different than everyone else. Maybe because I feel so different from others; you know, I have bumps all over me. Or, maybe it because I’m a dinosaur in a human world. Do you ever feel like that? Sort of feeling out of place? Here at arches, I feel just like everyone else! I’m standing with groups of people looking at and enjoying the same view, and no one stares at me. We’re all staring at the arches together. 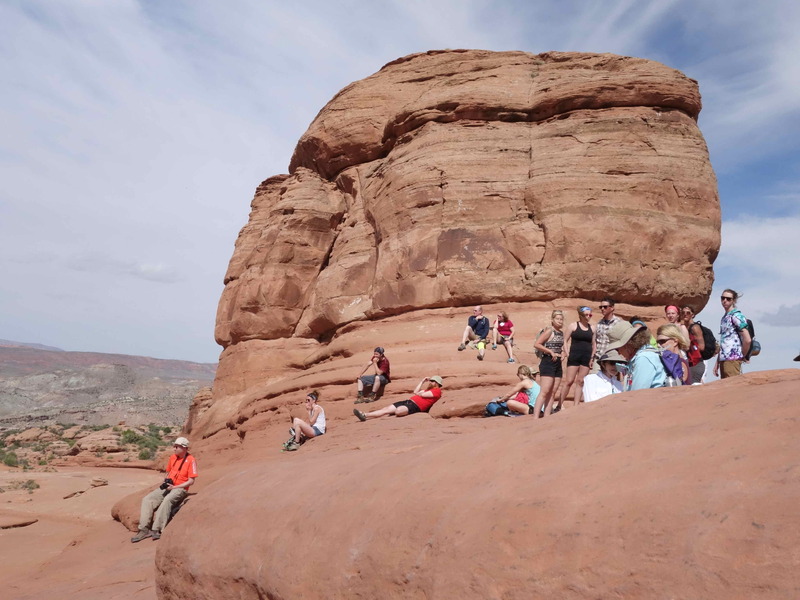 We’re a community of admirers staring at great big rock arches! 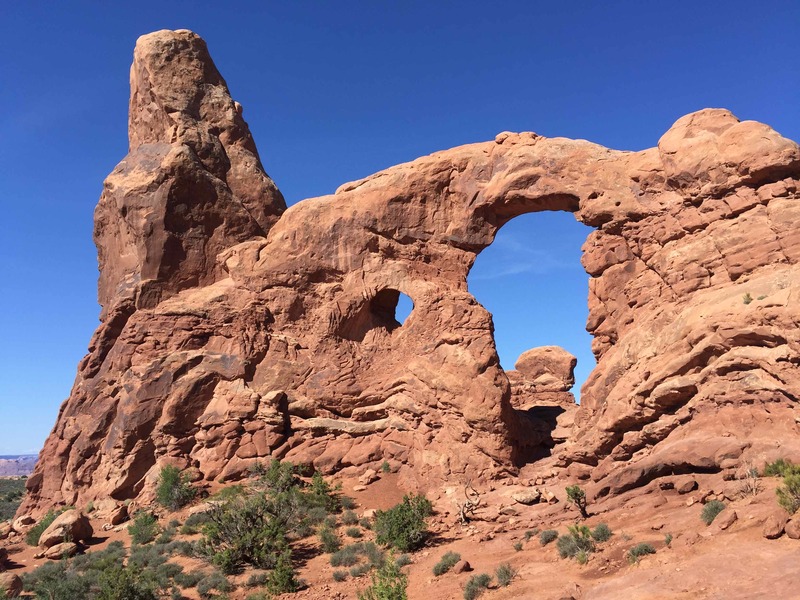 Almost all the visitors to Arches National Park want their picture taken with an arch. Me too! If you ever get bored by all the arches and rock towers, no problem. 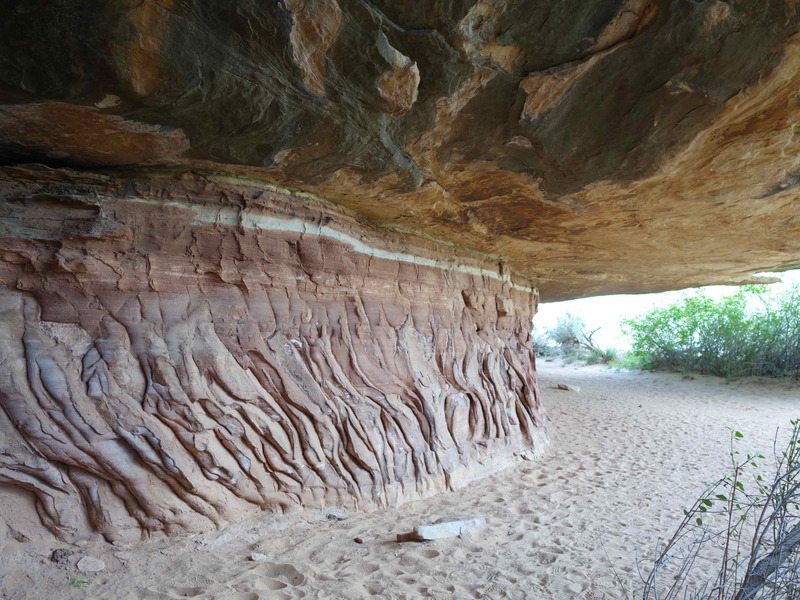 You can enjoy the Ute Rock Art that’s here. The sign here says that this rock art was made by indigenous peoples between 1650 and 1850. Also, very important, don’t touch the art; protect and preserve it. I’m going to miss Arches when we leave, but, at least, I’ll have my picture with an arch to keep with me. It’ll remind me that I’m really just like everyone else. Bye! I’m your friend. Another thing I want to show you about Canyonlands National Park: A lot of things appear to be upside-down, but they aren’t! It can be weird being in some of those spots that look upside-down but aren’t. Weird but fun. Really, you’ve got to visit this magical place. This picture confuses me. The big heavy rock should be at the bottom, right? We saw this on the Cave Spring Trail. When I first got near some of these upside-down places, just looking at them made my head feel funny, and my eyes wanted me to stand on my head. I’ve tried standing on my head and am no good at it. 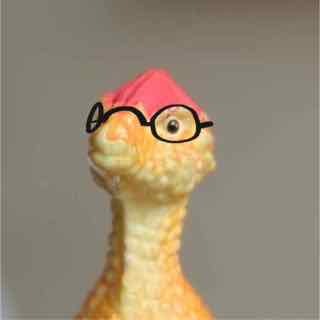 I think my head is too pointy. Can you stand on your head? How can I explain what happened to make these upside-down places in this huge park? Again, water and gravity went to work on these rocks and, over millions of years, just whimsically sculpted out weird formations. These magical, upside-down rocks make me think that they want an audience to look at them. Nona walked me under a lot of them, and they didn’t collapse on us. Wow, did these places have an audience when we were there. We weren’t the only ones enjoying these mind spinning views. On the other hand, it wasn’t too crowded, and everyone was very nice to each other. You know that everywhere we travel around the world and here in the US, the people we meet — plus the occasional plastic dinosaur cousin — are friendly and helpful. 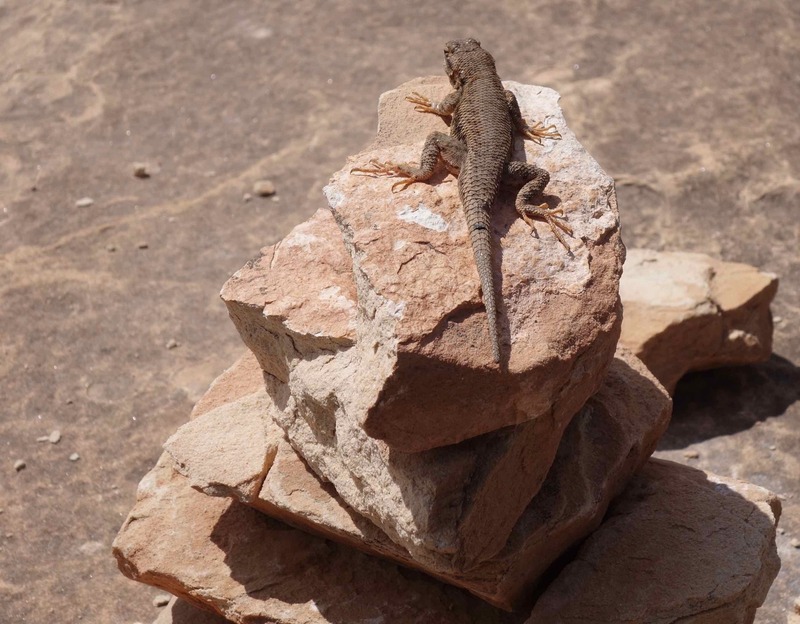 The lizards here seem to like the right-side-up type of rocks. Look at those long toes, good for climbing and hanging on! If I were living here, I’d be like that lizard. I like my world right-side up. Going to upside-down places is ok for amusement once in a while, but for day-to-day living I want right-side up. For example, who can work on an upside-down desk with and upside-down computer? I would never get a letter to you written! 9332 – pocket garden, Caption: “Ever hear the song, “Islands in the Stream?” This is more interesting; it’s an island in the Rock. 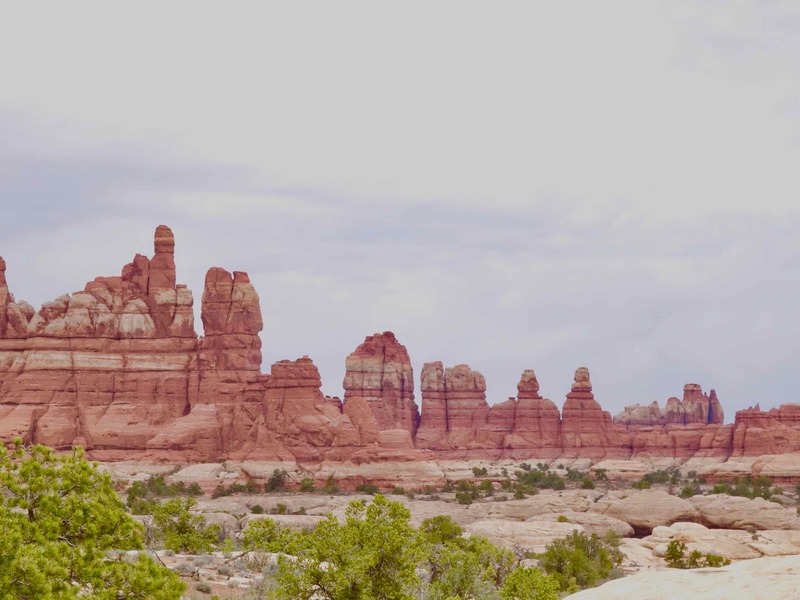 A lot of these islands can be seen in Canyonlands. Those island gardens started me thinking. I asked Nona, “Can we please make some island gardens like those when we settle down in a place some day?” She’s thinking about it, but says that where we’re going won’t have those big rocks to hold an island garden. Ever hear the song, “Islands in the Stream?” This is an island in the Rock. 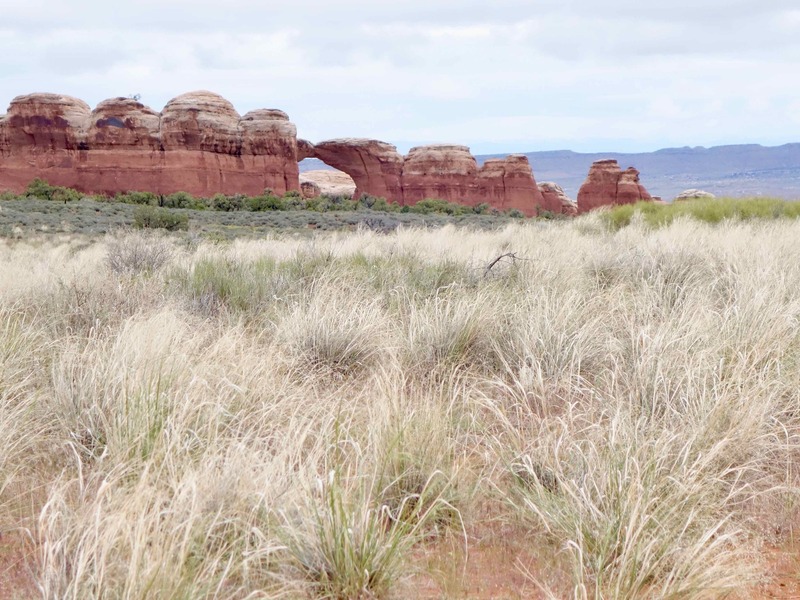 A lot of these islands can be seen in Canyonlands. That got me to thinking some more. I suggested that we could pour lot of concrete behind our place — if we ever stop traveling — and shape it like those rocks and make the garden in the depression after the concrete gets really, really hard. We just dump a pile of sand in the depression and put plants in it! Nona said, “Yes, we could do that, but we won’t because our neighbors would not appreciate a huge lump of concrete next to them.” She is so practical, and, as you can see, she really thinks about the other person, not just what she wants. I’ve got to work on that in myself. I guess I’m too focused just on what I want. Do you have any idea the strength of water? Yes, that stuff you drink, bathe in, and that just slops through your hands into the sink and disappears down the drain. I never, never thought of water as having strength. Muscles have strength, dynamite has strength, but I thought water was just a weak liquid. Wrong. 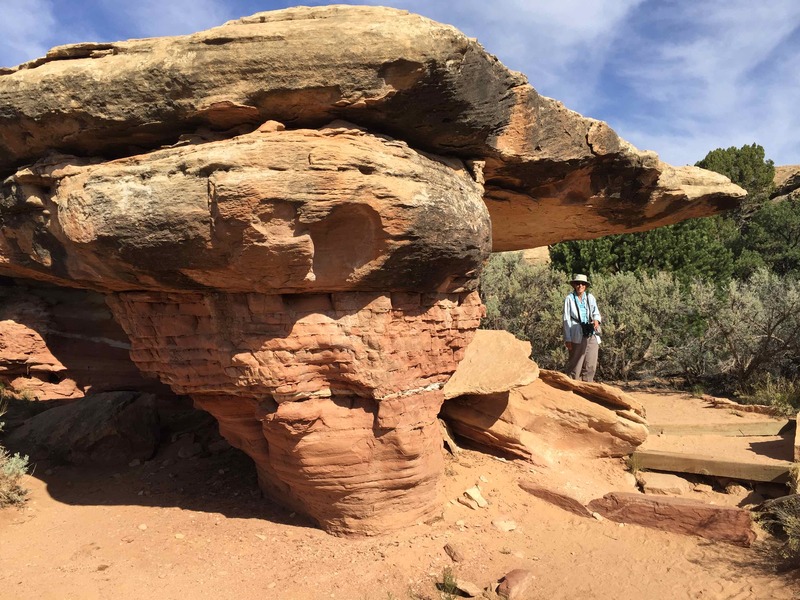 When Nona and Papa took me to a national park called Canyonlands, I learned about the amazing strength of water. Canyons opened my eyes to what water can do. 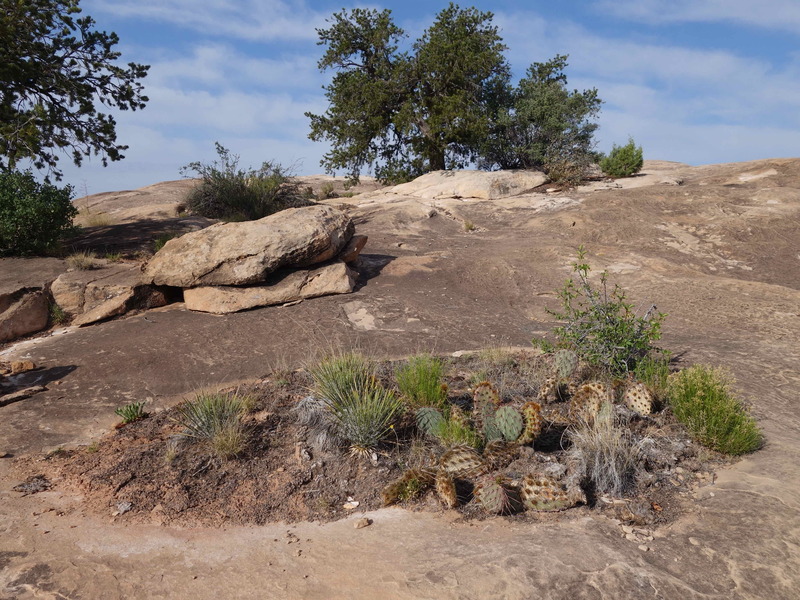 When you see rocks in the distance like those in my photo, you’ve got to ask yourself a question, “How did those rocks get like that?” Papa says that asking yourself questions and seeking answers to them might be the best part of growing up, although he liked riding his bike, too. So, that’s when I popped my question, “How did those rocks get like that, Papa?” He replied with a question, “What do you think, Solbit?” He does that a lot. Meanwhile, Nona’s thoughts were up in the clouds. Nona, our photographer-in-chief, says that she likes cloudy-day lighting for photos — not for lightening but for lighting. Papa and I like cloudy-day lighting for hiking. He doesn’t get so sunburned, and I don’t get more orange than I already am. Just imagine how may strong bulldozers and workers it would have taken to make these canyons and towers. Couldn’t be done. No way! But water did that. Well, water and gravity. 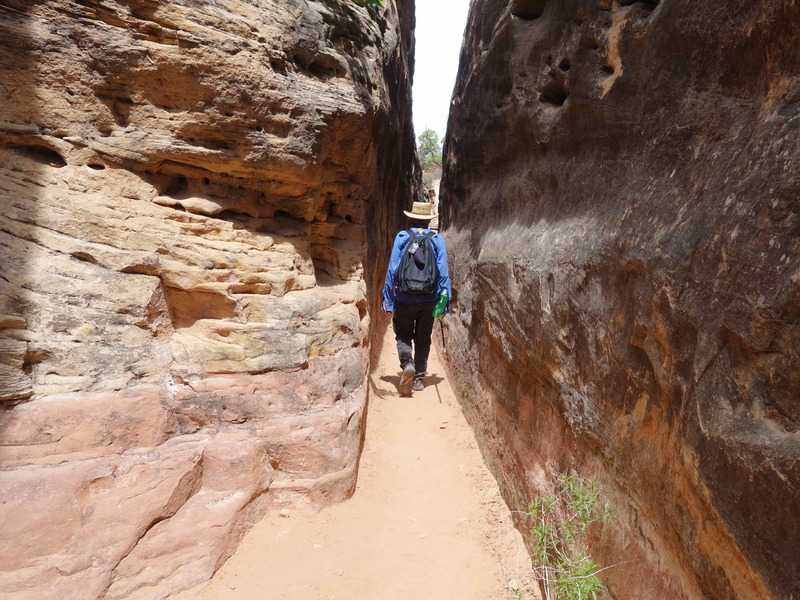 Papa led the way through this deep slot in the rocks. Water and gravity carved out this lovely place. We enjoyed going into places like this and being surprised by what we saw on the other side. 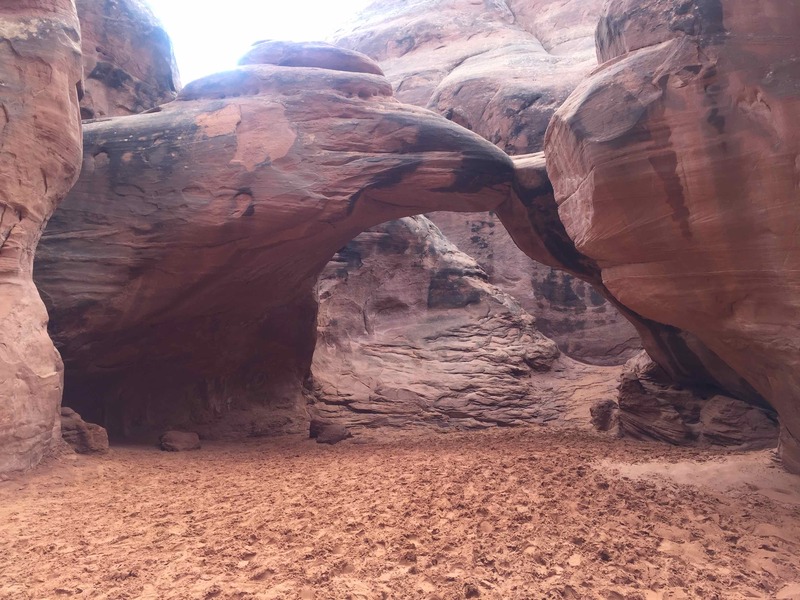 Canyonlands is full of surprises…all thanks to water and gravity! What a great day we had wandering around the canyons and asking questions. Just one of my best days ever, magical. On our ordinary travel days, I just stay put in Nona’s pocket. Not much to see or tell. So today was going to be one of those days, ordinary. It wasn’t. I had to — wanted to — get out of Nona’s pocket almost as soon as we hit Bluff, Utah — population less than 300, no kidding. 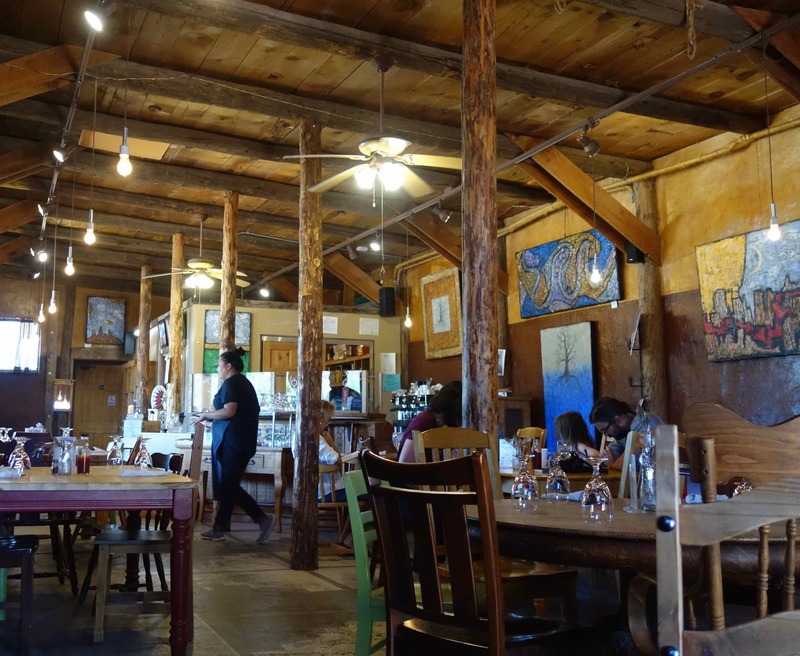 We had lunch at Comb Ridge Bistro and Espresso Bar in Bluff, Utah. Nona gave it 4 out of 5 stars, and she’s a tough one to please. Nona gave the bistro 4 out of 5 stars, and she’s a tough one to please. This restaurant has more than good food. They also have arts and crafts. That’s what really got me out of Nona’s pocket, although the sunshine salad might have done it too. 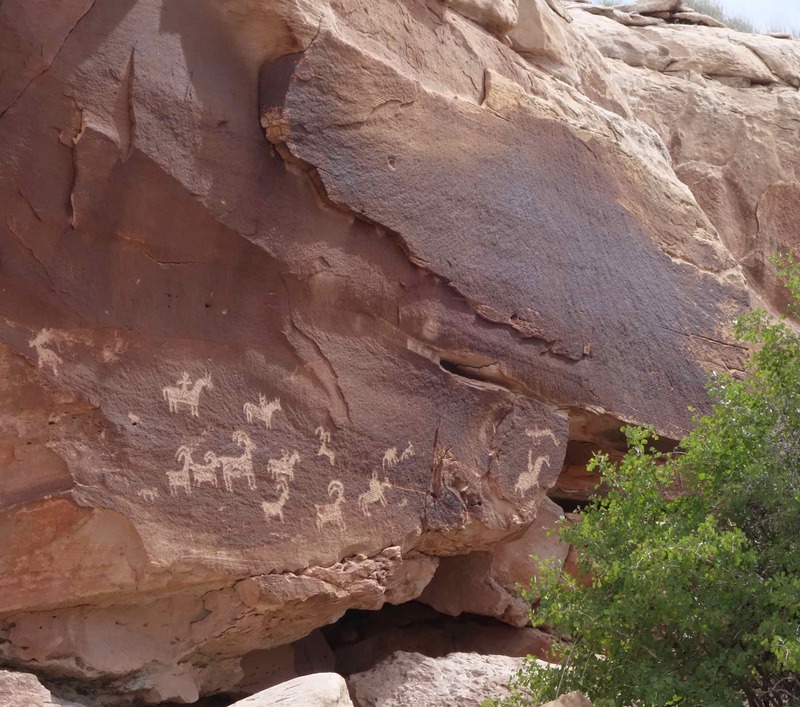 I had to see the little figure of a Navajo woman on a horse, carrying a papoose even smaller than I am. Nona bought it. She likes art. Oh, do you know what a papoose is? It’s a type of bag for carrying and protecting a child. When we asked who the artist is who made the little figure, the folks at the bistro sent us to Cow Canyon Trading Post to find out, just a short way down the road. Cow Canyon Trading Post sits across the road from this beautiful scene. Wow! 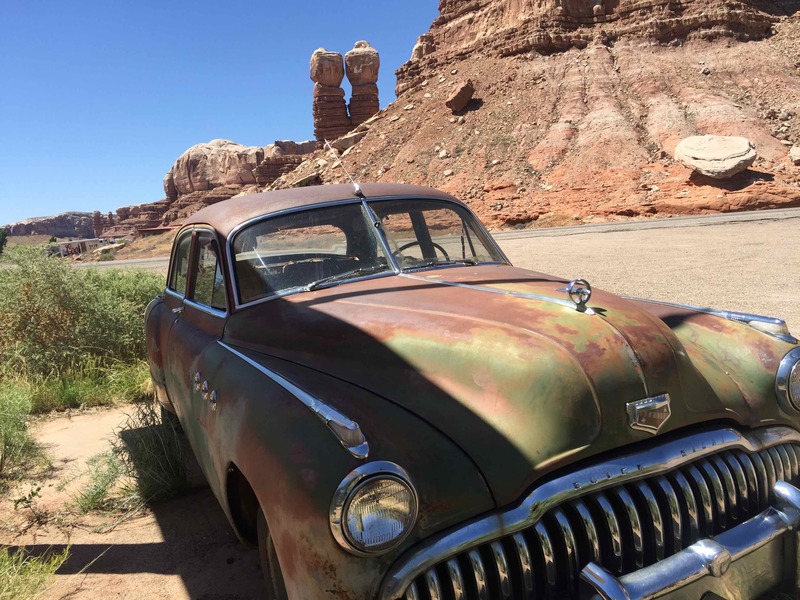 As we parked our car, we saw this very old car in the parking lot of the Trading Post. Papa thinks this might be a 1949 or ’50 Buick, maybe a Roadmaster. I think its a rusty old car. The trading post looked plain on the outside, but Nona and Papa really liked the way the inside was designed, and they liked the arts and crafts that were displayed. If we hadn’t known about the arts and crafts, I bet Papa would have driven right by this place. Nona said that, if we didn’t travel all the time and if we had an apartment, she would have bought several pieces of art here. 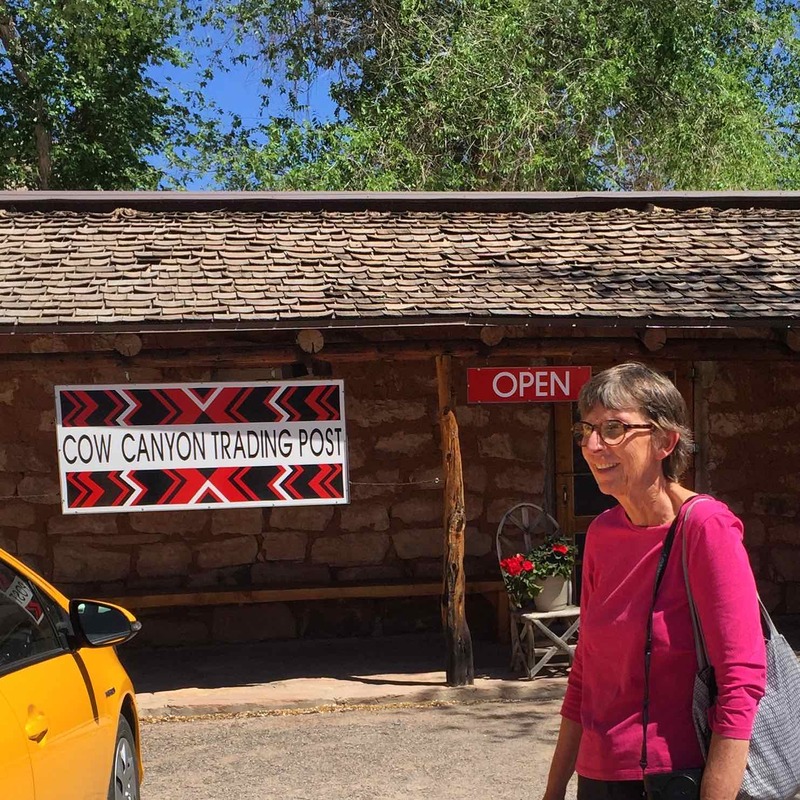 The woman who runs the trading post was very nice. Even though we didn’t buy anything, she was happy to give us the name of the artist who made the little figure. If you were going to buy a rug, you’d go to a department store or a rug store, right? That’s what I’d do, too. Makes sense. Not Nona and Papa and our friends, Robert and Carolyn. (We were camping with them. We’re in a tent. They have a modest size RV.) No, those 4 got a Navajo guide, Don, and he took us to see his aunt who lives in Canyon de Chelly. She makes rugs. Beautiful rugs. 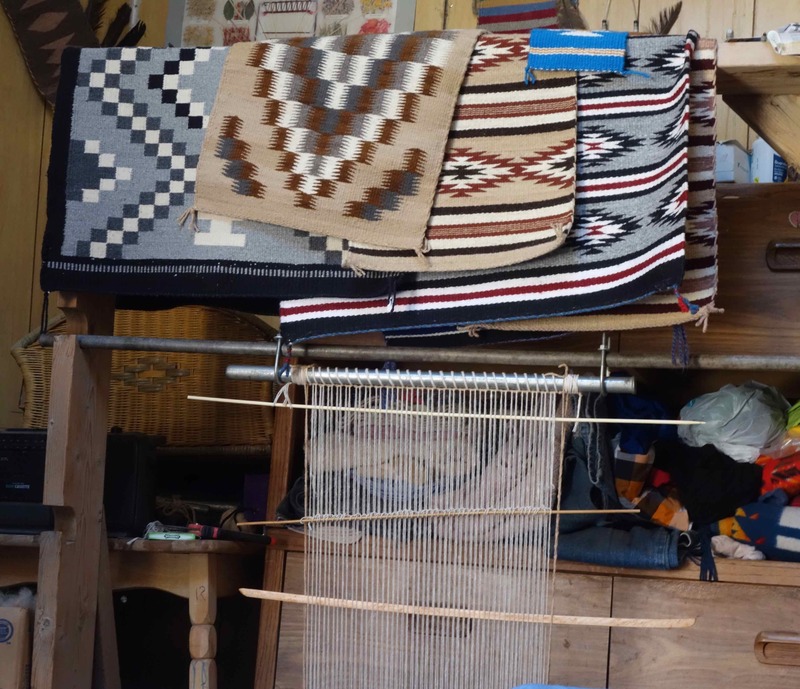 Ms Katherine Paymella sits just like this at her loom to make beautiful Navajo rugs. She is amazing! She raises her own sheep to produce the wool. She shears the sheep. She cards their wool. She cultivates special plants to make dyes to color the wool. She spins the wool into yarn. Then she puts the yarns on her loom. Yarns going in one direction are the warp and in another direction the woof. After all that loving labor, she starts to weave what will become a handmade Navajo rug. We could select a handmade rug from these and others at Ms Katherine’s hogan. 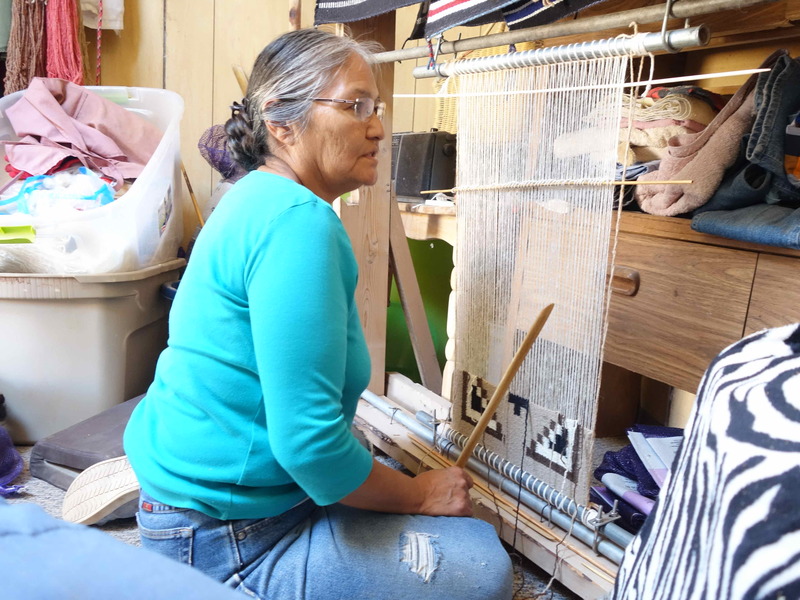 She said her designs are based on traditional Navajo designs, but she creates her own designs. Imagine how smart and talented you have to be to create a complicated design and then weave it into a rug. Also, just imagine too that someone — or maybe several someones — took the time and interest to nurture her talent and to teach her how to do all those different things. Remember that I said we went to a canyon to buy rugs? Here’s where we went. Can you tell that we were in a canyon? Ms. Katherine holds up the two rugs that we selected. Robert and Carolyn got one rug, and we got the other. I worried that our footsteps would get dirty marks all over our rug, but Nona explained away my worry. 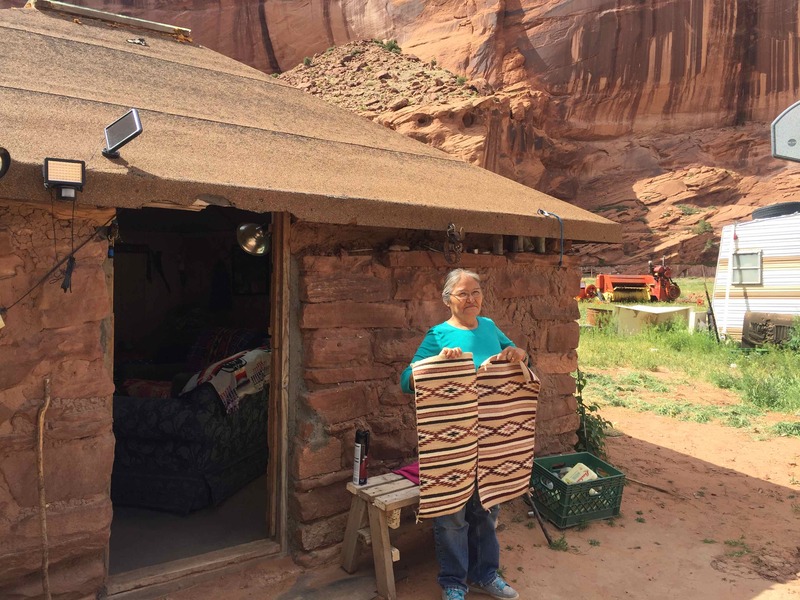 She said that our Navajo rug is a work of art, and we would display it on our wall at home so that no one would ever step on it but many eyes would fall on it.